Feria I, San Jose, Costa Rica, a photo by crclapiz on Flickr. Went to the local Sunday market to sketch people. 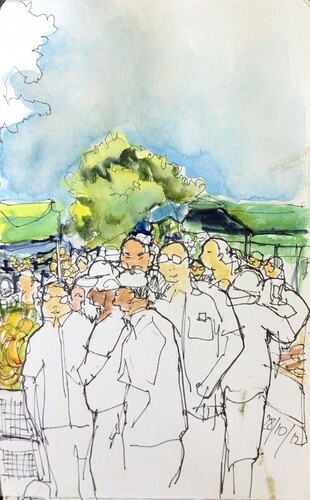 When I'm out sketching, I feel, I'm very much part of the scene, becoming one with vendors, tents and produce. The inofficial parking guy seems to agree - finishing my drawing and not carrying any market bags home, I'm not charged for parking - obviously, I had been out "working".